Wow! What a great book. 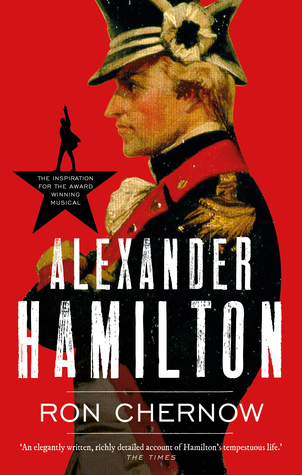 Chernow's Alexander Hamilton is probably one of the best biographies I've ever read. It is packed with detail, yet the prose is still engaging and you get sucked into the story side of things. Hamilton first hit my radar a few years back when I became fascinated with John André. I loved the letter he wrote to Washington on André's behalf, and began to wonder who this Hamilton was. It was only later I also became aware of the musical. I wanted to see it when I was in London over Christmas/New Year, but it was impossible to get a ticket. Nevertheless, I got the CD, and picked up this book shortly afterwards. Hamilton has definitely joined my list of 18th century crushes now! It took me a while to read this only because it was too heavy and cumbersome to read in bed, so I had to delve into a few pages here and there during the day when I had ten minutes to spare. That did at least draw out the pleasurable experience of reading it. All up, I would recommend this book to anyone interested in Hamilton or the American Revolution. It's a five-star read for me.